Have you been a victim of fake mortgage modification service firms that claim to assist you to settle your mortgage loans? Then you realize you have been cheated and your mortgage firm is threatening to foreclosure your house. This is the most painful experience that a number of people from USA have undergone through. When you find yourself in such a situation, you should seek help from sources that can assist you to recover the money you have lost from the fake loan modification services offering firms. 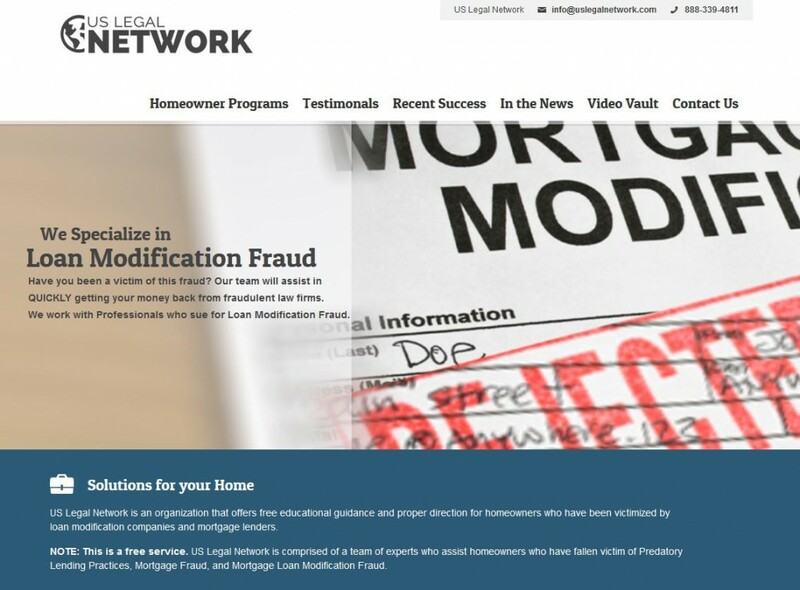 US legal network is an organization that has been offering assistance to people who have been corned by fake loan modification services companies. It offers advice, education and direction to the home owners who have fallen victim of mortgage lenders and mortgage modification companies. US legal networks do not charge any fee to the victims who seek their help. You only need to explain to us what you have gone through and we will offer our assistance to ensure you have recovered what you has been corned. US legal network is made up of a team of experienced professionals who offers their services to the home owners who have found them being cornered. The experts working in the USA legal networks have assisted many clients who have visited those seeking help. As a result of the many cases that they have encountered, they have understood the different loopholes that the mortgage modification conmen use to victimize their clients. Apart from assisting you in mortgage modification scam, we also offer some other services to ensure we have solved your mortgage setbacks. We ensure that we have assisted you in any US Legal services that you might require as you settle your mortgages. If you find yourself in any circumstance that you require our services do not hesitate to call us or email us. We are always committed to offering the best services to our clients.